Several new systems are available to campus users this semester. Ensemble Video is just one of them and, among other things, it offers a great service to anyone who has juggled DVDs in the classroom. With Ensemble, you can easily stream video clips for class viewing via Blackboard, WordPress, or other web site. One of my favorite features is the dropbox. Setting up a dropbox generates a link you can share with students or department members for easy uploading to your media library. Dropbox users click the link for an easy-to-follow webpage that walks them through the upload process—users never actually have to log in to Ensemble. Ensemble handles other types of media as well, including audio and image files. Contact me if you would like to know more about the service or if you would like a media library set up for you or your department. iTunes U (U for University) is a free service provided by Apple. Any computer that can run iTunes (available as a free download for both Mac and Windows) can access the wide variety of podcasts on iTunes U. Podcasts may be in PDF format, audio-only files, video or mixed media. You can easily incorporate links to podcasts into a Blackboard course with just a few clicks of the mouse. What can you find on iTunes U? Who will you find on iTunes U? Open iTunes and select iTunes Store from the column on the left (see screenshot below). 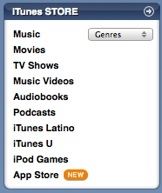 Select iTunes U from the list in the iTunes Store panel. Browse featured podcasts, or search by Category or Provider. Check out the most sought after topics in the Top Downloads list on the right. Click on the podcast that interests you to bring up the title area. 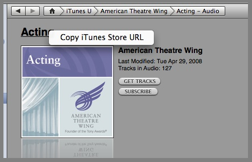 Right-click on the title and select Copy iTunes Store URL from the pop-up menu (see screenshot below). Login to Blackboard and navigate to the area of your Blackboard class where you want the link to appear. Press Control-V (Windows) or Command-V (Mac) to paste the URL. When students click on the link, iTunes will open directly to the podcast page. Clicking on the Get button downloads individual podcasts to the computer. Students can then view (or listen, if audio only) to the podcast on the computer or transfer it to their iPod. Want to know more about accessing or using media from iTunes U? Contact Anita at ext. 2543 or email athier.